Superdata has a new seasonal report out on the state of the digital games market. The research firm’s April figures show that World of Warcraft once again dominates the pay-to-play online games market, followed by classic Lineage, Star Wars: The Old Republic, TERA, and Blade & Soul — the last of which might surprise you. 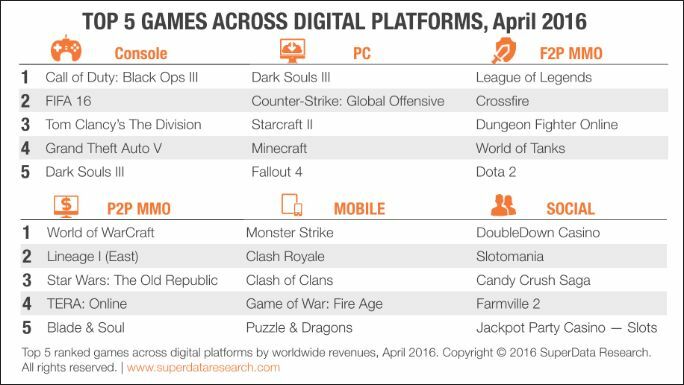 Dungeon Fighter Online also makes the list as third-highest-grossing free-to-play MMO, though as usual we point out that games like World of Tanks and League of Legends are also considered for this category. The top-five lists are below.